Digital assistants such as Google Now and Siri have been ubiquitous on smartphones for several years. With the Echo and Echo Dot, Amazon has taken this technology out of a handset and placed its ‘Alexa’ assistant inside hardware designed for the home. Using simple voice commands, Alexa can retrieve information, control music and manage a smart home. And while it sounds gimmicky we’d challenge anyone not to become at least a little smitten after a short time with these gadgets. Echo comes in two guises. 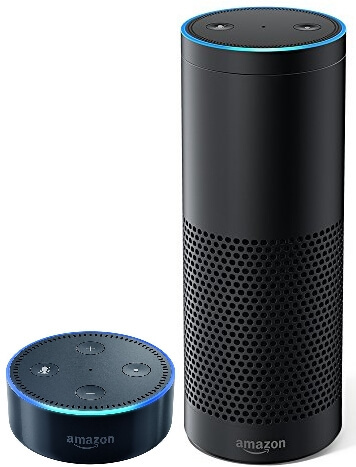 The £149.99 Amazon Echo, and £49.99 Amazon Echo Dot, each available in simply black or white. While the more expensive Echo sports a far better speaker, it’s important to note that the smart home and voice control features remain unchanged on the cheaper model, which makes the Dot particularly interesting. The larger Echo is a cylinder around 23cm tall and 8cm wide with an indicator light ring and manual volume control on the upper rim, and a couple of buttons (mute and manual listening trigger) up top. It has a pleasing weight and feels like high quality hardware. Some may prefer the gentler styling of the competing Google Home, but a no-nonsense design and lack of garish lighting, branding or intrusive noises should mean the Echo will fit into most homes without standing out. 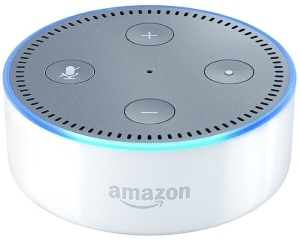 The Echo Dot does away with the more powerful speaker of its bigger sibling, and as such is significantly lighter and smaller, just 83.5cm wide and 32mm deep. It retains the indicator light but instead of a rotating volume ring you get regular buttons. It doesn’t look or feel quite as slick as the Echo, but on the plus side is so small it can be easily tucked away out of sight. The Echo and Echo Dot do not require piles of accessories. Micro USB power adapter (and optional 3.5mm audio output cable, in the case of the Dot) aside, these are wireless devices. There’s no network cable port and they rely on Wi-Fi and Bluetooth for communication. Bear this in mind before purchasing - if your Wi-Fi network signal is weak you may need to upgrade the router or install signal boosters. The biggest component of the larger Amazon Echo is a compact but powerful Bluetooth speaker. Its casing houses a 2.5-inch sub-woofer paired with a 2-inch tweeter, along with a ‘reflex port’ which Amazon says “enhances the woofer’s output for deeper sounds without distortion”. To our amateur ears the Echo speaker is good, though not exceptional. Bass delivers some punch without dominating proceedings, and it retains detail in the high notes. It can be cranked high enough to comfortably fill a large room and provide background noise during parties, though there is some noticeable distortion at very high volumes. For a second opinion we roped in a few nearby volunteers. They all preferred the more balanced sound of the Echo over a bass-heavy Anker A3143 Bluetooth speaker, but felt it wasn’t as good as a pair of sub-£100 bookshelf speakers which performed better overall. To anyone who takes their music seriously Echo will probably not compare favourably with a highly rated (and similarly priced) Bluetooth speaker such as the Bose Soundlink Mini II, or even an entry level mains powered speaker setup. But the Echo should easily satisfy the average listener, even if it doesn’t quite blow you away. Being much smaller, the Dot is obviously far inferior in terms of sound. Its puny little driver is on a par with cheap radio alarm clocks. It’s passable for radio or audio books in a small room, but best avoided for music. And yet...if audio quality is your primary concern you’re probably better off with the Dot. For £100 less you get the same voice controlled smart features and can output the audio to a preferred speaker setup with the 3.5mm output or Bluetooth connection. The Echo’s audio capabilities are just one part of the equation though. What sets it apart from other Bluetooth speakers is Alexa, the voice-controlled assistant living inside. - Alexa, how’s the weather? - Alexa, what’s on my calendar tomorrow? - Alexa, what’s the IMDB rating for [movie]? These are just a few of the many commands available. Alexa comes with numerous built-in capabilities, including lots of easter eggs, along with support for Spotify, TuneIn Radio, Amazon Music and Audible. Sadly, there’s presently no option to control either Apple Music or Google Music through Alexa, so to use these you’ll need to link a device over Bluetooth, which limits voice management to pausing, skipping tracks and adjusting volume. Additional functions can be added using ‘Skills’ - third party tools which add Echo compatibility for popular apps or expand Alexa’s reach. There’s no shortage of quirky hobbyist efforts padding the catalogue, but you’ll also find skills for the likes of Transport for London, The Guardian, EDF Energy, Uber and Just-Eat. It was a welcome surprise to discover just how well this all works. It’s not just the range of commands which impresses; Alexa’s voice control is also accurate and fast. Although you do need to enunciate quite clearly it doesn’t require an unnatural cadence to understand you. Rather than speaking like a robot as you would with those voice recognition systems offered by banks and insurance companies, commands can be issued casually. It quickly becomes second nature to ask Alexa for a weather report in the morning, play a song or set a timer when dinner goes in the oven as though you were speaking to a real person. However it’s not perfect. Alexa can be easily confused by ambiguous or unusual names, which we most often encountered when trying to play specific bands, tracks, albums or radio stations. We don’t blame her for not comprehending these, but you will need to have a smartphone or tablet to hand for manual control through the Alexa app when it happens. Alexa is a surprisingly useful (and occasionally silly) digital assistant, but she really shines as part of a smart home. 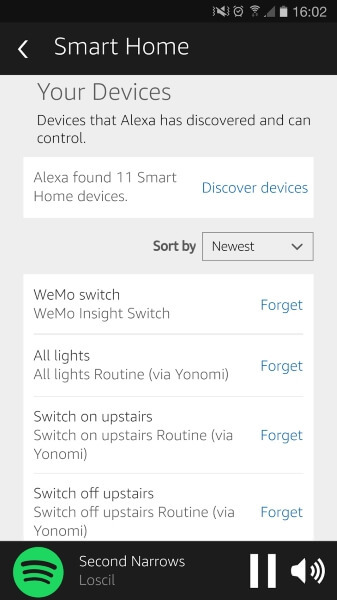 Out of the box Alexa includes support for smart home devices from Philips Hue, Belkin WeMo, Nest, Hive, Samsung SmartThings, Netatmo, LIFX and TP-Link. And many more can be added with Skills from the Alexa store and by integrating your Echo with IFTTT. When connected to smart devices the Echo can be used to control lights, central heating, appliances and anything else connected to compatible smart interfaces. Telling Alexa to switch off all the lights when you go to bed or turn up the central heating without leaving the sofa is a really neat addition to a smart home setup. Is it a little unnecessary? Absolutely. You can do all this from a tablet or smartphone. But a lot of smart home apps are clunky and slow; having Alexa do it with a spoken command takes a fraction of the time and is a lot of fun to boot. It feels like the future. Should you buy the Amazon Echo or Echo Dot? Alexa is more than just a gimmick, she proves herself a very effective way to request information and control media. Echo nudges into essential buy territory if you’ve got any of the supported smart home hardware, where the added functionality proves to be a very worthwhile addition. Whether you should choose the £149.99 Echo or £49.99 Dot will depend on what you’re looking to get out of the system. If you’re in the market for a Bluetooth speaker, the larger Echo is certainly worth considering. It would be overpriced if it were simply a Bluetooth speaker, but the extra features and smart all-in-one design justify the asking price. But if you already own a good set of speakers or are primarily interested in the smart home aspect of the Echo, the Dot offers the best value of the pair.